If you intensively work with Wowza applications, you probably have typical settings which you apply to each new app. Of course there are variations but most parts of configs are taken from some previous settings. Using WMSPanel Wowza server management feature set you can create applications of any kind with any config. So having some frequently used configs you needed to re-use old apps or keep your configs somewhere else. Now we've added ability to save your template application configs and just re-use it any time you want. 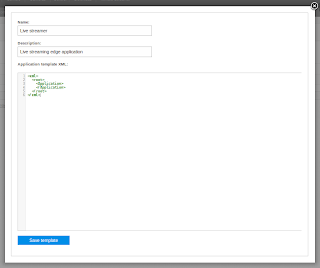 A template is a named XML configuration which is stored within WMSPanel. First, you need to define templates to use. Go to Control / Application templates menu. Here you see the list of app templates. Each template may be cloned or removed. Clicking on Add template or on existing template name you will go to edit dialog with name, description and a convenient XML editor with proper coloring. Having templates defined, you can go to Control / Server management and go managing a required server. Then you click on Create application, you can select which template you can use for it. 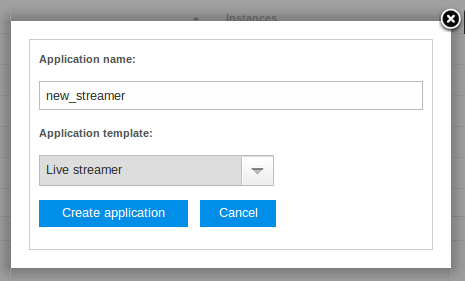 We've also made a few pre-defined templates so you could start creating your applications easily. You can check GoCoder support description to see example of GoCoder app template. Create Wowza application from template. Any existing application may be used for creating a template. 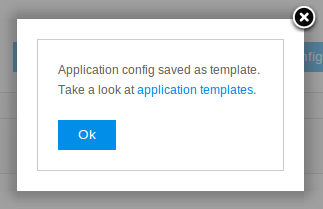 Being in application configuration page, click on Save configuration as template button to make it. You can create any number of templates and use them within your account along with pre-defined templates created by WMSPanel team. If you think you template should be good for everyone to re-use, please contact us so we could evaluate it and create as a global one. Haven't signed up for our Wowza control panel solution yet? Try it any time you want. We've recently updated our original blog post about Wowza server management. It now includes new screen shots and new capabilities description. We've added ability to change application settings not just via XML but using wizard style for basic settings. You can also remove any app instance as well as stop application entirely. Wowza Media Server has rich capabilities for extending its feature set. As a result both Wowza and third-party developers provide a number of add-ons for multiple media streaming use cases. Wowza Transcoder add-on is a highly demanded add-on which allows a variety of media transformations. Hence it's very popular among Wowza users. So WMSPanel team decided to support it as well as we previously added support for MediaCaster and LiveStreamRecord add-ons. To see it in action, just go to "Control" menu and select "Transcoder management". You will see the list of transcoders which are available with Wowza server. Clicking on the transcoder name will bring up transcoder management page. In this list you can also reset or shutdown any transcoder in a single click. As everywhere in WMSPanel management pages, there's transaction log, or just history, on this page. Wowza transcoders list with actions history. 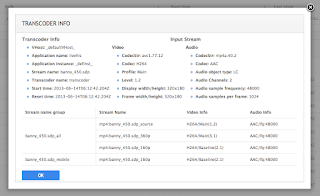 In the "Transcoder info" page there are two major areas - the various transcoder info itself and the list of streams which are currently handled. 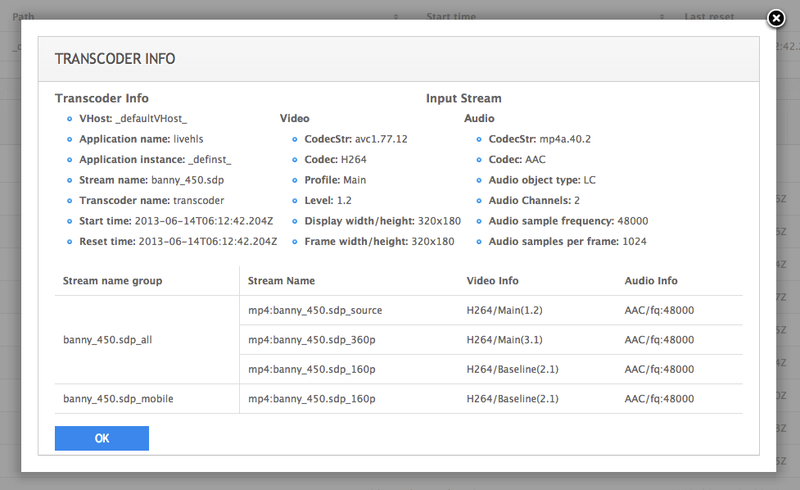 Wowza transcoder information and streams details. General transcoder information contain all parameters available for it including input stream details. Streams list has existing streams grouped by name and each stream has its video and audio info shown. 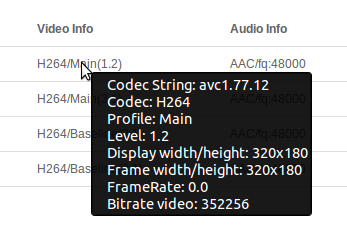 If you point to a particular codec, you will get a tool tip with extended info. Later on we plan extending transcoder control capabilities so this post will be updated as long as we make improvements. All features will be covered sooner or later. If you have any inputs for what it should do, or if you have some special cases, please contact us to share your thoughts. You may also consider WMSPanel server tasks remote management via web console for convenient control of server-side commands. Launch any command, like ffmpeg process, with no need to log in via SSH, just an easy-to-use web interface. To see functionality this in action, take 2 weeks free trial by signing up and installing our Wowza agent. UPDATE: WMSPanel team released an article describing the recommended approach to load balancing for HTTP-based protocols like HLS, DASH, Icecast etc. Please use the described technique to build your own balancing solution rather than described HTTP redirect-based approach. Please find new improved geo-location HTTP streaming load balancing which includes partial URI processing.